World's Richest Man Steps Up Giving Despite Wariness About Charity. It doesn't take Carlos Slim Helú long to voice his discontent with philanthropy. Mr. Slim, a Mexican businessman who by some estimates is the richest person in the world, is sitting in an office at Grupo Financiero Inbursa, a bank that makes up one piece of his corporate empire. The room is hardly ornate, particularly for someone of Mr. Slim's net worth, which Forbes estimates to be about $69-billion. His Malcolm S. Forbes Lifetime Achievement Award, given to "heroes of entrepreneurial capitalism," hangs on one wall. Mr. Slim certainly has the resources to be a hero of the nonprofit world. But that has never been his precise ambition. As the 72-year-old rose through the ranks of the world's billionaires, he stepped up his giving, too, contributing, by a spokesman's count, $4-billion since 2006 to a foundation that bears his name. He started an institute devoted to health in Latin America in addition to expanding the work of his telecommunications company's Telmex Foundation, which since 1996 has supported an array of education, health, and sports projects. In the last half-dozen years, Mr. Slim’s organizations have begun making eight-figure pledges to the likes of the Broad Institute and the World Wildlife Fund and working with the William J. Clinton Foundation and the Bill & Melinda Gates Foundation on projects to fight poverty in Latin America and improve health care for Central America and Southern Mexico’s poorest. But Mr. Slim, who says he stepped down a few years ago from day-to-day management of his companies in part to focus on foundation work, has often voiced skepticism about philanthropy. That has frustrated some people in the nonprofit world, who say his giving lacks transparency, amounts to only a small fraction of his wealth, and has yet to produce the results to which the telecommunications, retail, and banking mogul says he aspires. And on this spring afternoon, he seems more interested in playing philanthropy provocateur than advocate. That’s why his health institute has supported projects aimed at newborns, he says, to start children on a path to success. And that idea is behind the Telmex Foundation’s support of efforts to teach Mexicans computer skills and cover the costs of elective surgeries for disabled workers. Mr. Slim declines to specify plans for future giving, saying that his and other business executives’ contributions of time, perhaps more than their money, could have a greater impact. In 2007, he said he would increase his foundations’ assets to $10-billion within four years, a target he hasn’t yet met. Mr. Slim also emphasizes the opportunities to produce social benefits through profit-making enterprises, an approach he says is more enduring than charity. He has revitalized a downtown neighborhood of Mexico City, for example, by opening businesses and by financing social programs through revenues from a parking lot he owns. Despite his wariness of charity, Mr. Slim has created a collection of nonprofits whose missions are nearly as diverse as the companies he controls. His Telmex Foundation supports stipends for university students, bicycles for rural schoolchildren, and surgeries for needy Mexicans, along with sports teams and natural-disaster response. It also finances an institute devoted to teaching computer skills and expanding Internet access. Mr. Slim also owns a bail-bond company that posts the bail for poor people accused of petty crimes, some 93,000 since the late 1980s. Through his health institute, he is exploring ways that cellphones can monitor the medical condition of vulnerable pregnant women. He supports efforts to improve Mexico’s organ-transplant system. Last year, he opened a new museum to house his $100-million art collection. “He has extraordinarily broad interests—in science, engineering, anthropology, medicine, public welfare,” says Eric Lander, who leads the Broad Institute, in Boston, which received a $65-million pledge from Mr. Slim’s health institute to explore the genomic factors that lead to cancer and diabetes. Nonprofit leaders who’ve worked with Mr. Slim say his dislike for simply throwing money at problems makes him a demanding, passionate supporter who is committed to putting his energy into helping them strategize. Omar Vidal, director general of the World Wildlife Fund’s Mexico affiliate, says Mr. Slim regularly calls him in the evenings to check up on his foundation’s $50-million pledge to conserve six regions of Mexico. (See Page 19). “He is not someone who will give you money not knowing what it will do,” says Mr. Vidal. Yet some nonprofit leaders in Mexico say Mr. Slim’s efforts aren’t adding up to nearly as much as they could. They worry that his focus on his own nonprofit organizations, and on for-profit ways to tackle social issues, is driven by stinginess and a lack of sophistication about the breadth of nonprofit work. His foundation’s annual reports list the number of bicycles and eyeglasses donated or surgeries for which he’s covered some costs, but they don’t provide an accounting of finances or impact, says Mónica Tapia, who leads Alternativas Y Capacidades, a Mexican nonprofit devoted to encouraging local philanthropy. She and others lament that most of his money appears to go to his own organizations and that his foundations don’t seem to have any kind of clear application process. Financial information the Carlos Slim Foundation provided to the Mexican government in 2010 shows assets of roughly $2.7-billion, with just $2.6-million spent on programs and $1.1-million donated to other groups. In 2007, the foundation gave roughly $280-million, nearly all of it to establish Mr. Slim’s health institute. Christopher Martin, a former Ford Foundation employee who now works as an education consultant in Mexico, says Mr. Slim has identified some of the right priorities in his education work, like promoting Internet access and early-childhood education. His giving also seems to be reaching many people: More than 240,000 students have received stipends from the Telmex fund since 1997, the foundation says. But while those numbers are impressive, Mr. Martin says it’s hard to assess whether Mr. Slim’s education work makes a big difference. Mr. Slim’s reliance on broadband and cellphones in his education and health projects also gives rise to concerns that he’s trying to expand business for his telecommunications company. But Roberto Tapia, who leads Mr. Slim’s health institute, says technology combines promising ways to promote access to health care with the organizations’ expertise. Yet even Mr. Slim’s critics note that Mexico doesn’t have the same philanthropic tradition as the United States. Large-scale giving is new, charity has tended to be informal, and it’s only in the last five years that the Mexican government has required nonprofits to disclose information on their finances. 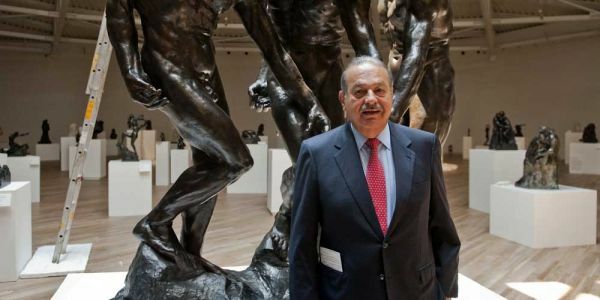 Also, philanthropy has sometimes been viewed in Mexico as a form of tax evasion; Mr. Slim’s son-in-law Arturo Elias Ayub, head of the Telmex Foundation, is quick to point out that Mr. Slim’s contributions to his private foundation have already been taxed. Mr. Slim has no patience for critics. Mr. Slim, the reluctant philanthropist, is one of six children of a Lebanese-born businessman. He trained as an engineer and says that as a student he donated his teaching stipend from the university to students with less money. But he shrugs off a suggestion that this gesture was the start of his giving. After school, he went into business and had, by the mid-1980s, acquired companies including Grupo Sanborns, a prominent retail chain, the hotel company Bimex, and the Mexican branch of the tire company Firestone, as well as shares in aluminum, cigarette, cotton, and mining companies. In 1990, when the Mexican government started privatizing national industries, Mr. Slim bought Telmex, the phone company. Today the company and its corporate parent, America Movil, which was initially a mobile-phone spin-off of Telmex, control about 70 percent of Mexico’s mobile market and 80 percent of landlines. Those companies have brought Mr. Slim vast wealth but also criticism from government officials and others who say he’s a virtual monopolist who overcharges his customers and depresses Mexico’s economic growth. Mr. Slim strenuously denies these sorts of criticisms, although he recently agreed to make changes to his business practices to avoid a nearly $1-billion fine from Mexico’s government. To illuminate his views on philanthropy, Mr. Slim is fond of turning to Khalil Gibran, the Lebanese-American writer and poet. His message: It’s easy for rich people to write checks. (They don’t even write the checks themselves, he jokes. They have an employee do it for them.) What’s more difficult, and more important, he says, is putting one’s time and energy into solving social problems.